This is my favorite way to wear a Plissé. It's such an amazing look and yet it takes less than 20 seconds to achieve. I hope this 'how to' video works, it's the first time I am posting one. I used my Projet Carré Plissé and Regate scarf ring, but any other similar shaped scarf ring would do. The knot turns out differently every time and it's fun to discover the different shaped flowers it produces. For a bigger 'flower' follow the same instructions, but leave out the simple knot at the begining. Not only the knot, but the How to video is fab!! Congrats!iSight is a wonderful tool, no? Hugs, V.
Thank you so much for the video. I was curious how you did this. I am definitely going to have to get a plisse now. They are so glamorous and interesting. Now I have to pick a color, the fun part. Glam it up and have fun, BM! The video is FANTASTIC! NOW I get it. Thank you so much for sharing. 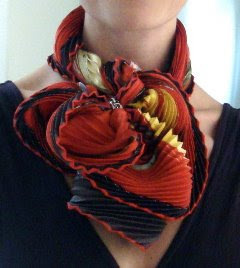 (At the risk of sounding pushy...maybe you could show us some of your other knots on other scarves this way?) I am loving this blog, thank you for your generosity. Thank you Mai Tai! I tried it last night for Symphony (Boston) and got many intrigued stares. You are right about the look being different every time. So much fun!!! Thanks for posting this! It's so simple - how did I not know how to do this?! A-T-G, thanks sweetie! Hope to see a pic of you with it soon. the flower knot is just so beautifully done! makes me want to get a Plisse and a regate ring right a way...i'm not good in wearing scarf so a lot of my collection had just sat at the bottom of the draw since i brought them home, but reading your blog inspires me and i think i can wear them more often to "spice" up my look. A Plissé is a great purchase. Just be careful not to get it wet (not even rain), as the pleats would disappear. It is dryclean only. Over the years and with heavy use the pleats may flatten a bit/become loose. It has not happen to mine yet, but I have heard about it. You can send it to H and have it repleated for arond 35 Euros. Hi Again! I just wanted to say hello - and I continue to be wow-ed by everything you do - I am having so much fun with my regate - THANK YOU!!! Love that flower knot - makes it look so wonderful each time! I am curious though - I've seen some pictures where people wear their plisse's in a simple loose knot around the neck - my favourite way to wear them - but the problem for me is they slide undone after a while - how do you make sure that doesn't happen? Happy to hear you got the Regate in the end and that you are having fun with it. I know what you mean about the Plissé coming loose. You could secure the knot very simply, by threading both Plissé ends (coming from the same direction) through your Regate ring and then sliding the ring upwards just until the knot. Hope this helps! MaiTai, I've just watched your video and tried it on my plisse! OMG, how amazingly simple a technique to achieve such a beautiful result! Guess which scarf I'll be wearing tomorrow? Lol. Thank you for your video! This looks really nice. It looks like the Regate ring is no longer made, so I could I please ask which of your scarf rings could substitute this (I am worried about damaging the scarf with too small a ring). members can have the best possible assistance. Together with being able to lose weight, but this time for their product.